The single woman jumped. She jumped, and jumped, and jumped, and eventually got off the toilet and wiped. “Where is my boyfriend?” She said. She looked all around but she did not see him. “I will go look for him,” she said. So away she went. Down, out of the very small studio she went. Down, down, down. The single woman knew she shouldn’t take an Uber because she wanted to #resist, but she could walk. “Now I will walk and go find my boyfriend,” she said. She came to a lonely man at a bar. “Are you my boyfriend?” She asked. The lonely man just looked and looked at her. He did not say a thing. He pretended she did not exist. So she went on. Then she came to a another man at the bar. “Are you my boyfriend?” She said to the man. Then she came to one of her past sexual partners. “Are you my boyfriend?” She said to her past sexual partner. The lonely man was not her boyfriend. Her cousin was not her boyfriend. Her past sexual partner was not her boyfriend. So she went on. Now she came to a Lyft Line driver who could take her to a friend’s housewarming party. She would have taken the G except it had been so unreliable the last few months, and besides, her boyfriend was not on the G because hopefully he lived in Manhattan. “Are you my boyfriend?” She said to the driver. “No, and I’m also not your driver. Get out of my car,” the driver said. The lonely man was not her boyfriend. Her cousin was not her boyfriend. Her past sexual partner was not her boyfriend. The driver was not her boyfriend. Would she ever find a boyfriend? At the party, she saw her college lab partner. “Could my college lab partner be my boyfriend?” But her college lab partner was with someone else, which the single woman thought was weird because he’d been sliding into her DMs for the last month. “You could be my boyfriend!” She called out. But her college lab partner did not look up. He walked into another room and pretended not to see her. The single woman went on. Just then, the single woman saw her most irritating coworker. He trapped her in a never-ending conversation about his fleece. “Oh no, you are not my boyfriend,” said the single woman, “I have to get out of this conversation.” But the single woman could not get away. The irritating coworker went on, and on, and on, and how much can you really say about a North Face anyway? The single woman had never been to New Hampshire. She did not ski because she did not understand why anyone would voluntarily be cold. “Oh, oh, what am I going to do?” The single woman said to herself, “I just want a boyfriend!” But then something happened. A handsome man came over to pull her out of the conversation. “Do you know who I am?” Said the handsome man. “Yes, I know who you are. You are not the lonely man, you are not my cousin, you are not my past sexual partner, you are not my driver, you are not my college lab partner, you are not my most irritating coworker. 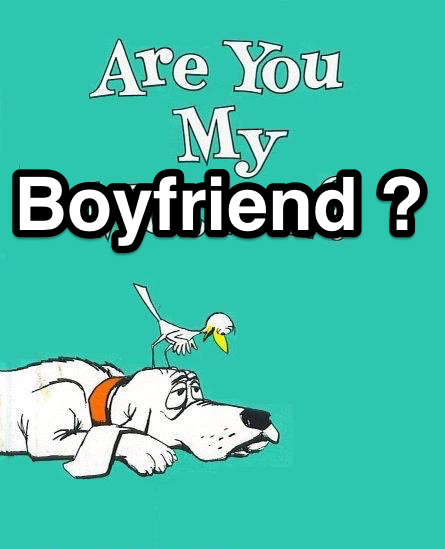 You are a handsome man, and you are my boyfriend,” said the single woman. The no-longer-single woman handed him a tissue and rolled her eyes. “I’m not your mother,” she said.